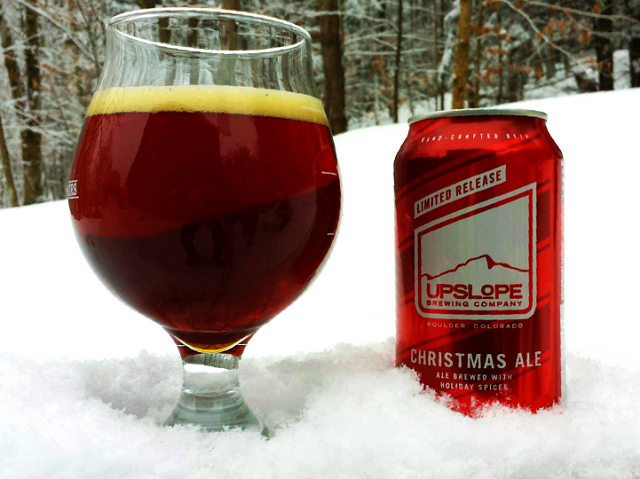 The Upslope Christmas Ale was the one brew I requested for this season’s 12 Beers of Christmas. Luckily, the Boulder, Colorado brewery sent me two cans. Because when I was in the midst of the Cold That Wouldn’t Die (Or So It Seemed), I had a can of the Christmas Ale and it struck me as absolutely flavorless. Now I can see just how far gone I was, since this is one of the more flavorful beers of the entire 2017 crop. Just to be on the safe side I asked my wife to stick her nose in the glass and she pounced on “Clove,” without hesitation. It’s there, all right, although I found it more pronounced in the flavor than the aroma. I picked up some plum or raisin, caramel, vanilla, ginger and cinnamon. None of it overwhelming, all swirling together quite invitingly. The flavor is just as alluring, tilted toward a Belgian-style strong ale to be sure, with an Abbey yeast, though less sweet than often typical in Belgian Christmas ales. A dark brown beer with ruby highlights and a lightly tan head, this is actually one of the better balanced spiced ales I’ve had, with all of the perfumy spicing, caramel sweet malts and a lightly bitter finish playing in great harmony. There’s little evidence of the alcohol, so maybe it’s just as well this isn’t in an oversized cork bottle. It just tastes that way. But I sure wish I hadn’t squandered that first can. I requested the Upslope because I wasn’t likely to find any nearby; it’s distributed only in five western states, lucky for them. I’d heard good things about the brewery—the little we hear about small Colorado breweries here in the east. Not that Upslope is that small anymore. It was founded in late 2008 and after a few skimpy years took off like a rocket, by 2016 producing more than 30,000 barrels a year. It’s always had an outdoorsy and environmental bent, putting all of its products into cans, easier to stuff into your backpack and recycle. That included an additional holiday beer this year, a Wild Christmas Ale aged in rye barrels with a sour culture, refermented on black raspberries, and eventually squeezed into 19.2-ounce cans. Sounds alluring, but I didn’t get to try that one. It was part of what the brewery calls its Lee Hill series which, along with its Tap Room Series, takes in the one-offs brewed out of Upslope’s two Boulder locations. 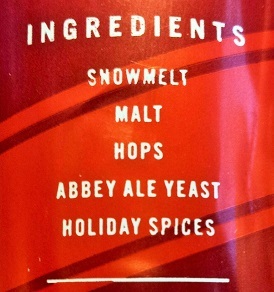 The Christmas Ale first appeared in 2009, based on an old homebrew recipe of Upslope founder Matt Cutter. There are five year-round Upslope beers, including a highly touted 6.7% ABV Brown Ale, and a 4.8% Craft Lager designated as a 1% brew, meaning one percent of all profits go directly to Trout Unlimited. 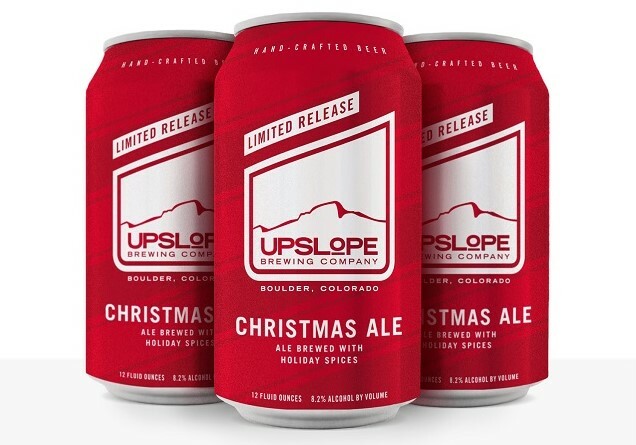 One of the conservation group’s purviews is keeping waters running clean, so it’s a natural for Upslope, which lists its first ingredient on the Christmas Ale can as: snowmelt. Tom has written about golf and golf travel for American Airlines’ luxury magazine Celebrated Living since 1999, and for Travel & Leisure Golf, Golf Connoisseur, Virtuoso Life, Lexus Magazine, Acura Style, Tee It Up, American Way, The Met Golfer and many others. Before his first golf article, Tom had established his chops as a beer expert; as far as he knows he remains the only member of both the Golf Writers Association of America and the North American Guild of Beer Writers.